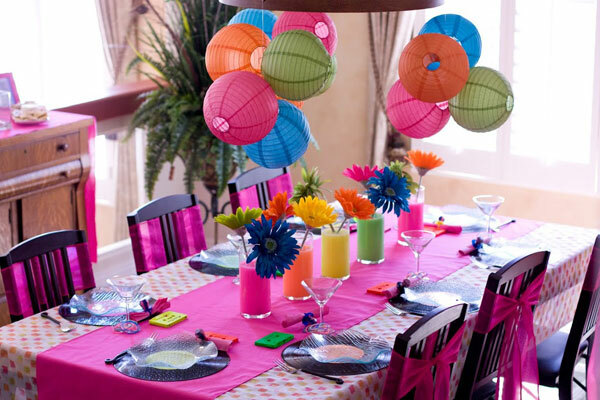 Paper lanterns are a great way to add fun and color to your home or a backyard party! PartyLights.com offers a variety of sizes, shapes and colors that can be used on their own, or illuminated using our lights. We offer a number of great options including string light sets, individual battery operated lights, and single socket pendants to light up individual lanterns. 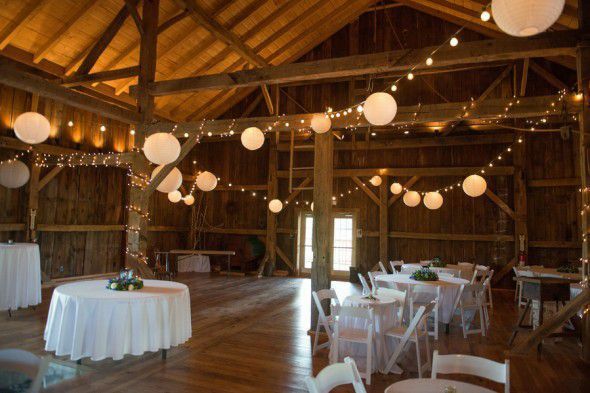 The most popular way to use lanterns is to hang them from string lights. There are lots of great options, but we find that C7 string lights or C9 string lights work particularly well. 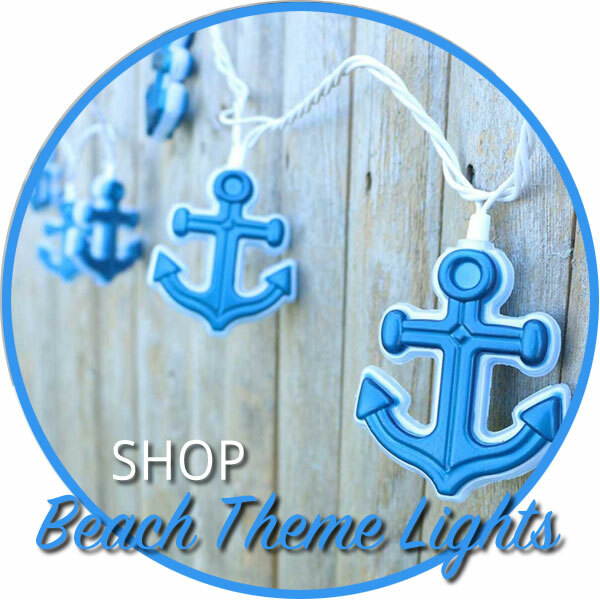 You can hang as many or as few lanterns as you’d like along the strand … plus sizes and colors can also be mixed! String light sets and lanterns may be purchased separately to get the exact length, size and colors you want, or purchase one of our pre-packaged lantern & string light sets. Our C9 string lights come in lengths ranging from 14 ft. to 100 ft. and socket spacing of 12”, 24” and 36”. The variation in socket spacing allows you to pick the cord that works for your event depending on the size of your lanterns and if you want to put them on every bulb or prefer them more spaced out. You can also consider colored bulbs to enhance the color of the paper lantern. For greater flexibility, we can cut strands to your desired length to make your own custom string light. With the choice of 24”, 36” or 48” spacing, custom strands are perfect for our paper lanterns since you can hang even our largest 18” lanterns on every bulb! With easy installation, they’re great for lighting tents, backyards, buildings and much more. Battery operated light kits allow lanterns to be hung wherever you’d like them. Use fishing wire or ribbons (not included with lanterns) to suspend your lanterns at varying heights for a beautiful effect. We have basic LED battery operated lights or extra-bright battery operated lights with 12 LED bulbs. The extra-bright LED battery operated lights are also available with an optional remote control, which allows you to turn on and off groups of lanterns using one controller. Pendant lights are great for hanging clusters of lanterns at varying heights, or for showcasing an individual lantern. Pendant lights are available with a standard cord, and also as new fabric twist cord light pendants for a more unique, decorative look. Get creative pendant lighting with our Fabric Twist Cord Pendant Lights. They come in a variety of colors, ranging from earthier gold, pewter or dark red, to bolder bright turquoise, green and poppy. These fabric cord pendants use medium base bulbs (standard household size bulb) and look great when mixed with other colored cords or looped around architectural features. They feature an inline on/off switch as well as a switch on the socket for easy use in any situation. Our standard Lantern Electric Kits are offered in two socket sizes: medium & candelabra base. Medium base sets are 12 feet long and hold a standard size bulb up to 60 watts. Candelabra sets are 10 feet long and hold a candelabra (E12) base bulb up to 40 watts. Both sizes come as a hanging set with an on/off switch located near the plug for convenience. 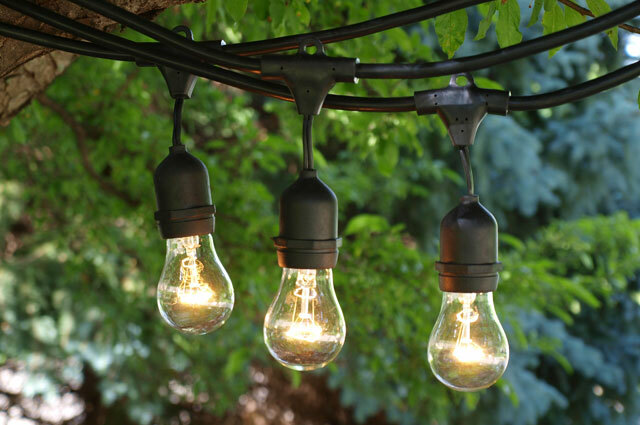 In each case, they’re ideal for hanging sporadic lights, and they also give the option for the brightest lights. For both indoor and outdoor setups that are more permanent, or for a more durable option, commercial string lights make a great choice. Whether you’re an event planner expecting to use them repeatedly for events, or a bride or homeowner that wants a professional look, these heavy duty cords will not disappoint. The difference with commercial string lights is in the quality of the cord and the socket design. Bulbs of the same socket size are interchangeable between standard and commercial grade strings, but commercial grade strings use heavy duty wire, and use special sockets that seal out water. They can also use a higher wattage bulb for darker settings. 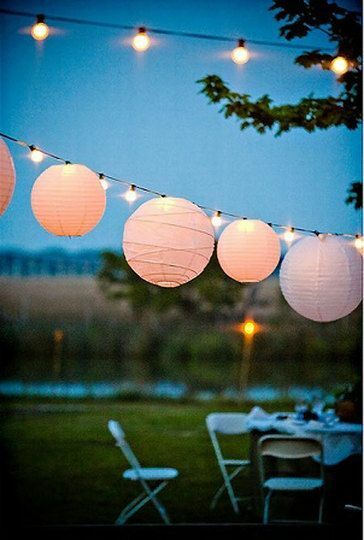 Paper lanterns look fantastic when paired with these durable string lights, but nylon lanterns can also be used for more semi-permanent installations. While they’re obviously not made for harsh conditions, nylon lanterns can stand up to modest variations in the weather. Just remember, paper lanterns can be beautiful hung on their own. You can skip the lights altogether and still create something spectacular. Lanterns can be easily hung using fishing line, or for a different look, use ribbons or decorative cords. Plus, there’s a rainbow of color options – over 40 different selections! 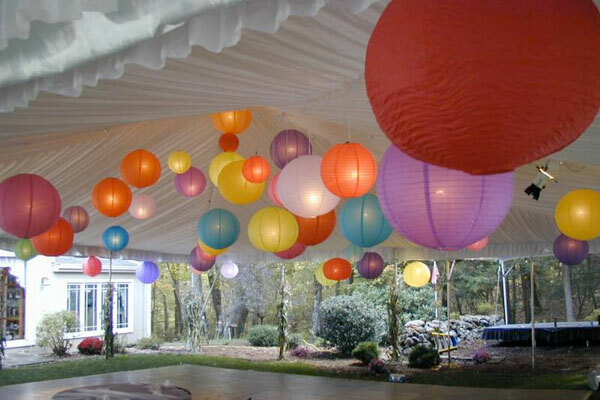 Round paper lantern are available in six different sizes from 8 to 18 inches, and you can mix and match the sizes and colors of the lanterns makes for a unique eye-catching look. Also, paper lanterns are not limited to simple globe shapes. There are stars, cocoons, beehives, and squares, as well as other unique shapes. Get creative! 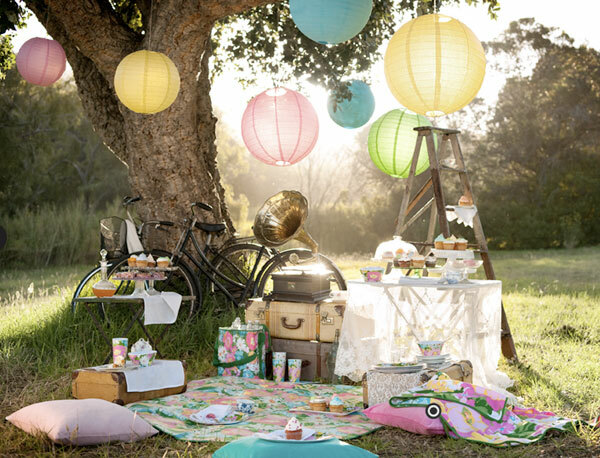 Have a great picture of how you use paper lanterns? We’d love to see what you’ve done! Email us or post a picture and tag us on Facebook (@partylightscom) or Instagram (@partylights_com).